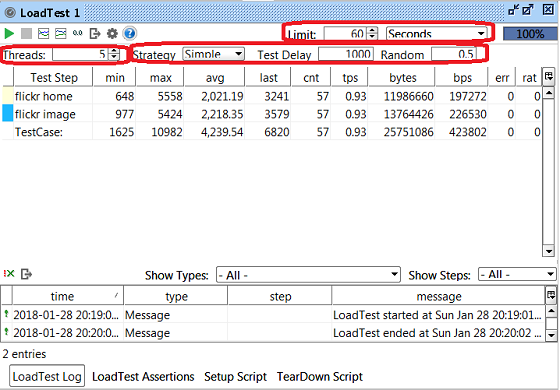 What are load test parameters supported in SoapUI? Threads - Default is 5. Threads specifies the number of threads used to run the same test case concurrently. The more threads you use, the more load is added to the remote server. Strategy - Default is "Simple". Strategy specifies how each thread repeats the test case. "Simple" means repeating test case with a configurable delay time, which gives the remote server a constant load. "Variance" means repeating test case with variable delays, which gives the remote server a variable load. "Burst" means repeating test cases to give the remote server a burst load pattern. Test Delay - Default is 1,000 milliseconds. Test Delay specifies the average delay time before each thread repeat the test case again. Random - Default is 0.5. Random specifies the how much time of the delay to randomize. 0 means no random and 1 means all random. Limit - Default is 60 seconds. Limit specifies how long the load test should last.